2 Train Engines: 1 engine is missing its top hatch. PreOwned Item. Very good condition. 2 Brick Structures. 1 Waiting Platform. I believe the firetruck is missing its ladder trailer. Mister Rogers. (Truck has a paint defect on the side. Bus has paint mark smudges). Yellow School Bus and TruckONLY. I have LOTS of these buses and trucks with various defects. (Mister Rogers. Bus is in excellent condition). Yellow School Bus and TruckONLY. I have LOTS of these buses and trucks with various defects. Mister Rogers. (Truck has a chip on the base by the magnet. The bus is in excellent condition). Yellow School Bus and TruckONLY. I have LOTS of these buses and trucks with various defects. Doors open. Sounds and lights work. Brio Bob the Builder Wooden Roley Green Tractor. Brio Wooden Train - 4 Animals. MYKIDS Precision Crafted Hardwood Train Set,New Condition,Brio compatible. In excellent used condition is this Imaginarium railway roundhouse with turnable for any wooden railway set. Sounds work great – require 2 button batteries (not included). In excellent used condition is this Imaginarium magnetic crane for any wooden railway set. Crane turns easily and the crank is easy to use to raise and lower the magnet. Here is a large lot of 41 pieces of wooden signs, animals, buildings for Thomas the Train or Brio sets. Not sure of the manufacturers of these pieces, probably a mixed lot. These pieces are in nice gently played with condition. In Good Shape or Better. it been played with. See photos. Not sure of maker, but is compatible with Thomas the tank or Brio. I believe that Thomas the tank is made by Sodor. This is a lot of 8 Wooden Train Cars Vehicles. 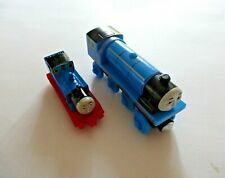 I believe they were from IKEA but are Thomas and Brio Compatible. All are in good used condition. Shipped with USPS First Class Mail. Thomas, Brio, ERTL. Lift Crane, includes Car. Wooden Train. more THOMAS. I can, and will, fix problems. played with condition. The lot consists of 9 double sided curved sections and 1 double sided short straight section. Cute mixed lot. Pet and smoke free. That's the cheapest way I can get them anywhere. And more, Dumping Train. Thomas, Brio, ERTL. Car with Load and Custom. I can, and will, fix problems. played with condition. Push lever on side for platform inside to move attendant back & forth.